Eco-Audit Grant Recipient: Armed with the results of their 2016-17 Public Spaces audit, Ed and his students received $1,953.37 in micro-grant funding to design school learning spaces that live and breathe – including a turtle tank, aquaponics system, and teaching gardens. Combining a designer’s spirit with a hard science background, Ed brings a sense of collaboration to his campus and beyond. Not only is he transforming the traditional classroom model into a student leadership generator, he continues to share lessons learned with the wider education community. Alongside EcoRise Program Director Abby Randall, Ed even presented Design Studio curriculum implementation at the EL Education National Conference in Chicago in October 2017. 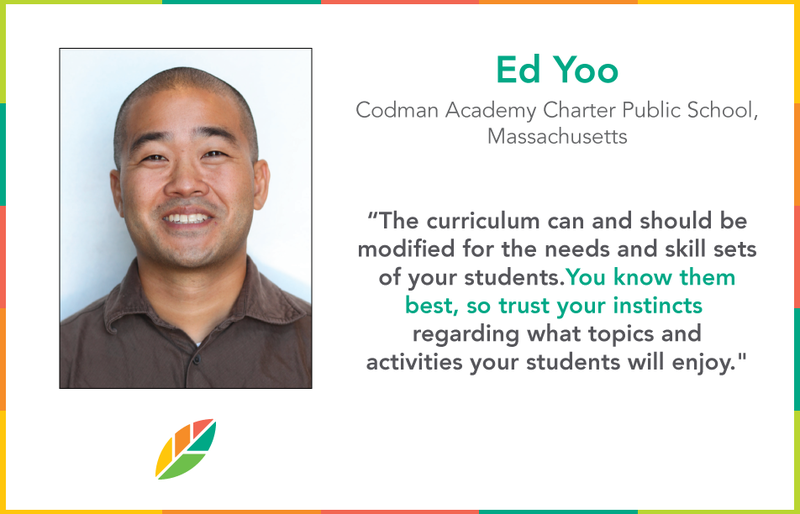 Want to know more about how Ed utilizes EcoRise at Codman Academy? Check out this blog!